The STOMP Out Youth Tobacco Use campaign was created to increase merchant education on age of sale requirements and help decrease youth access to tobacco products and exposure to tobacco advertising. As a part of this initiative, in supporting merchant education programs we can provide the STOMP OUT youth tobacco use sticker and merchant pledge to retailers across the state. STOMP stands for Stop Tobacco Offenses Merchant Program. By implementing the STOMP OUT campaign into the tobacco merchant community, we hope to spread the word of the new age of sale (21 years and older) and help merchants show that they care about the youth of their communities. Below are the videos from our webinar in which we introduced all of the component of STOMP 21. Click on the video to learn more about our resources, like the responsible retailer pledge, school resources & cessation resources. Help us celebrate Kick Butts Day on March 21st! Kick Butts Day is a national day of activism that empowers youth to stand out, speak up and seize control against Big Tobacco. 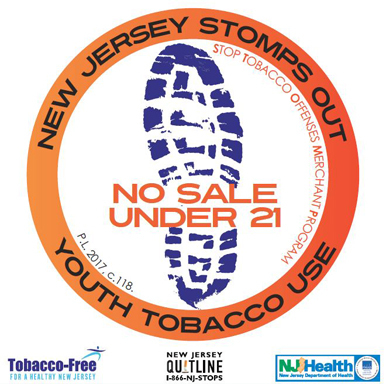 This is a great opportunity to utilize Tobacco Free for a Healthy NJ’s new campaign STOMP 21. This campaign focuses on educating tobacco retailers & youth about the new age of sale (now 21 years & older) among other important information regarding the dangers of tobacco products. Specifically STOMP 21 focuses on the Point of Sale, youth can use this opportunity to show how Big Tobacco targets them with their advertising to start them down an addictive path with nicotine.